The other day I stood on my head. I stood on my head because I can! I stood on my head because I hadn’t done it in decades and I wondered if I could still do it. When I came back right side up, I felt great! It was an autotelic activity. Autotelic activities are those that you do just for the joy of doing them. Not for external reward. Not for money. Not for glory. Just the act of doing them is reward itself. For me playing ringette is another autotelic activity. When I go home after a game, my hub asks me what the score was – and I usually don’t know – sometimes I don’t even know who won. Yes, really! But… I love it – I love playing that game. I love skating fast (well, my version of fast!) with the cool air blowing through my helmet. I love digging hard for the ring. I love picking up a perfect pass. I even love falling down when I’m trying hard to stop the ring. I love chasing the other skaters and trying to keep up. Now I’m not suggesting you stand on your head or play ringette, although we are always looking for players, but I’m asking you to think about your day, your week, your month and notice how many things you are doing just for the love of it. Adding more autotelic activities to your life it’s just one more way to live Your Life, Unlimited! This week on Your Life, Unlimited radio – we enjoyed the inspiring time spent with Les Wiens, who spoke about investing in yourself, creating a philanthropic goal for the year and seeing if our goals match our ‘whys.’ He is more than a financial planner, he is a community advocate who, along with his wife Terry, makes our world a better place. Also on the show was the Idea Sculptor, Maggie Chicoine. Maggie talks about her life altering ‘dent,’ feeding your brain in addition to your body and asking good questions. “Albert Einstein’s mother Pauline knew what to do. Apparently, she asked her little dyslexic genius, “What good questions did you ask today?”. Obvious questions are often not asked. Assumptions lead to flawed solutions and short-sighted decisions. 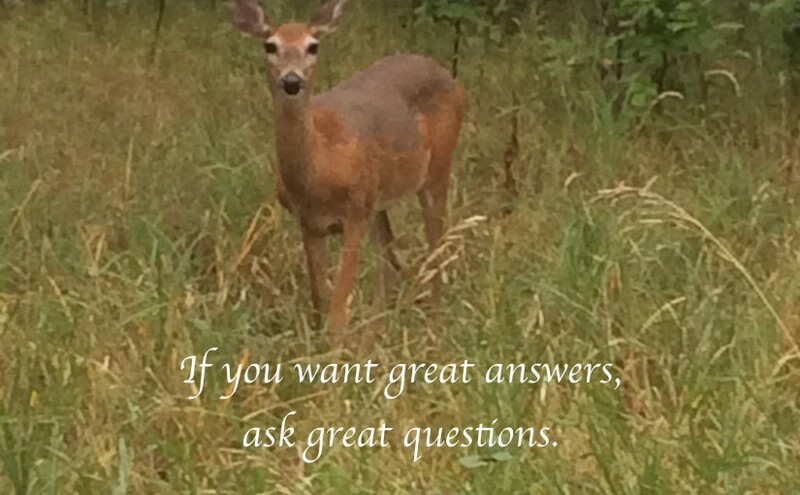 Questions clarify. Take Lois Lane, for example. She never did ask Superman if he knew Clark Kent. Questions, carefully designed, bring out the best in people. Questions develop employee engagement: commitment, truth, integrity and innovation. They are the foundation of dialogue, especially when they are aimed at gathering more information. Try “Tell me about…” as a substitute for “who, what, when, where, how”. Eliminate “why” for now. Why? People get defensive instantly. Ask each other what’s important, and better still, what’s most important? The right questions will lead to the right people, making the right decisions, for the right reasons, at the right time. This entry was posted in Blog, Motivation and tagged cjob, empowerment, Inspiration, personal growth, Stephanie Staples, Your Life Unlimited. Bookmark the permalink.